11 A None No Power Seat 11 A is a standard Business Class seat that is missing a window. 11 K None No Power Seat 11 K is a standard Business Class seat that is missing a window. 14 A None No Power Seat 14 A is a standard Business Class seat that has a misaligned window. 14 K None No Power Seat 14 K is a standard Business Class seat that has a misaligned window. 17 B None No Power Seat 17 B is a standard Business Class seat. 22 D None No Power Seat 22 D is a standard Economy Class Bulkhead seat that has some extra legroom. The tray table is in the armrest, making the armrest immovable and slightly reducing seat width. There is no floor storage for this seat during takeoff and landing. 22 E None No Power Seat 22 E is a standard Economy Class Bulkhead seat that has some extra legroom. The tray table is in the armrest, making the armrest immovable and slightly reducing seat width. There is no floor storage for this seat during takeoff and landing. 22 F None No Power Seat 22 F is a standard Economy Class Bulkhead seat that has some extra legroom. The tray table is in the armrest, making the armrest immovable and slightly reducing seat width. There is no floor storage for this seat during takeoff and landing. 22 G None No Power Seat 22 G is a standard Economy Class Bulkhead seat that has some extra legroom. The tray table is in the armrest, making the armrest immovable and slightly reducing seat width. There is no floor storage for this seat during takeoff and landing. 23 A None No Power Seat 23 A is a standard Economy Class seat that has extra legroom, however, it is missing a window. The tray table is in the armrest, making the armrests immovable and slightly reducing seat width. There is no floor storage for this seat during takeoff and landing. 23 B None No Power Seat 23 B is a standard Economy Class seat that has some extra legroom. The tray table is in the armrest, making the armrests immovable and slightly reducing seat width. There is no floor storage for this seat during takeoff and landing. 23 C None No Power Seat 23 C is a standard Economy Class seat that has some extra legroom. The tray table is in the armrest, making the armrests immovable and slightly reducing seat width. There is no floor storage for this seat during takeoff and landing. 23 H None No Power Seat 23 H is a standard Economy Class seat that has some extra legroom. The tray table is in the armrest, making the armrests immovable and slightly reducing seat width. There is no floor storage for this seat during takeoff and landing. 23 J None No Power Seat 23 J is a standard Economy Class seat that has some extra legroom. The tray table is in the armrest, making the armrests immovable and slightly reducing seat width. There is no floor storage for this seat during takeoff and landing. 23 K None No Power Seat 23 K is a standard Economy Class seat that has extra legroom, however, it is missing a window. The tray table is in the armrest, making the armrests immovable and slightly reducing seat width. There is no floor storage for this seat during takeoff and landing. 36 A None No Power Seat 36 A is a standard Economy Class seat, however, the close proximity to the lavatories and galley may be bothersome. 36 B None No Power Seat 36 B is a standard Economy Class seat, however, the close proximity to the lavatories and galley may be bothersome. 36 C None No Power Seat 36 C is a standard Economy Class seat, however, the close proximity to the lavatories and galley may be bothersome. 36 D None No Power Seat 36 D is a standard Economy Class seat, however, the close proximity to the lavatories and galley may be bothersome. 36 E None No Power Seat 36 E is a standard Economy Class seat, however, the close proximity to the lavatories and galley may be bothersome. 36 F None No Power Seat 36 F is a standard Economy Class seat, however, the close proximity to the lavatories and galley may be bothersome. 36 G None No Power Seat 36 G is a standard Economy Class seat, however, the close proximity to the lavatories and galley may be bothersome. 36 H None No Power Seat 36 H is a standard Economy Class seat, however, the close proximity to the lavatories and galley may be bothersome. 36 J None No Power Seat 36 J is a standard Economy Class seat, however, the close proximity to the lavatories and galley may be bothersome. 36 K None No Power Seat 36 K is a standard Economy Class seat, however, the close proximity to the lavatories and galley may be bothersome. 39 A None No Power Seat 39 A is a standard Economy Class Bulkhead seat that has some extra legroom, however, the close proximity to the lavatories and galley may be bothersome. This seat is also missing a window. The tray table is in the armrest, making the armrests immovable and slightly reducing seat width. There is no floor storage for this seat during takeoff and landing. 39 B None No Power Seat 39 B is a standard Economy Class Bulkhead seat that has some extra legroom, however, the close proximity to the lavatories and galley may be bothersome. The tray table is in the armrest, making the armrests immovable and slightly reducing seat width. There is no floor storage for this seat during takeoff and landing. 39 C None No Power Seat 39 C is a standard Economy Class Bulkhead seat that has some extra legroom, however, the close proximity to the lavatories and galley may be bothersome. The tray table is in the armrest, making the armrests immovable and slightly reducing seat width. There is no floor storage for this seat during takeoff and landing. 39 H None No Power Seat 39 H is a standard Economy Class Bulkhead seat that has some extra legroom, however, the close proximity to the lavatories and galley may be bothersome. The tray table is in the armrest, making the armrests immovable and slightly reducing seat width. There is no floor storage for this seat during takeoff and landing. 39 J None No Power Seat 39 J is a standard Economy Class Bulkhead seat that has some extra legroom, however, the close proximity to the lavatories and galley may be bothersome. The tray table is in the armrest, making the armrests immovable and slightly reducing seat width. There is no floor storage for this seat during takeoff and landing. 39 K None No Power Seat 39 K is a standard Economy Class Bulkhead seat that has some extra legroom, however, the close proximity to the lavatories and galley may be bothersome. This seat is also missing a window. The tray table is in the armrest, making the armrests immovable and slightly reducing seat width. There is no floor storage for this seat during takeoff and landing. 4 A None No Power Seat 4 A is a standard Business Class seat with additional legroom. 4 D None No Power Seat 4 D is a standard Business Class seat with additional legroom. 4 G None No Power Seat 4 G is a standard Business Class seat with additional legroom. 4 J None No Power Seat 4 J is a standard Business Class seat with additional legroom. 4 K None No Power Seat 4 K is a standard Business Class seat with additional legroom. 40 D None No Power Seat 40 D is a standard Economy Class Bulkhead seat that has some extra legroom, however, the close proximity to the lavatories and galley may be bothersome. The tray table is in the armrest, making the armrests immovable and slightly reducing seat width. There is no floor storage for this seat during takeoff and landing. 40 E None No Power Seat 40 E is a standard Economy Class Bulkhead seat that has some extra legroom, however, the close proximity to the lavatories and galley may be bothersome. The tray table is in the armrest, making the armrests immovable and slightly reducing seat width. There is no floor storage for this seat during takeoff and landing. 40 F None No Power Seat 40 F is a standard Economy Class Bulkhead seat that has some extra legroom, however, the close proximity to the lavatories and galley may be bothersome. The tray table is in the armrest, making the armrests immovable and slightly reducing seat width. There is no floor storage for this seat during takeoff and landing. 40 G None No Power Seat 40 G is a standard Economy Class Bulkhead seat that has some extra legroom, however, the close proximity to the lavatories and galley may be bothersome. The tray table is in the armrest, making the armrests immovable and slightly reducing seat width. There is no floor storage for this seat during takeoff and landing. 50 A None No Power Seat 50 A is an Economy Class seat, however, this seat may have restricted legroom due to the misaligned seats and the awkward configuration transition from 3 to 2 seats. While you have some extra storage space, you'll have to maneuver your legs around the extra seat anchors. The tray table is in the armrest, making the armrests immovable and slightly reducing seat width. 50 B None No Power Seat 50 B is an Economy Class seat, however, this seat may have restricted legroom due to the misaligned seats and the awkward configuration transition from 3 to 2 seats. While you have some extra storage space, you'll have to maneuver your legs around the extra seat anchors. The tray table is in the armrest, making the armrests immovable and slightly reducing seat width. 50 J None No Power Seat 50 J is an Economy Class seat, however, this seat may have restricted legroom due to the misaligned seats and the awkward configuration transition from 3 to 2 seats. While you have some extra storage space, you'll have to maneuver your legs around the extra seat anchors. The tray table is in the armrest, making the armrests immovable and slightly reducing seat width. 50 K None No Power Seat 50 K is an Economy Class seat, however, this seat may have restricted legroom due to the misaligned seats and the awkward configuration transition from 3 to 2 seats. While you have some extra storage space, you'll have to maneuver your legs around the extra seat anchors. The tray table is in the armrest, making the armrests immovable and slightly reducing seat width. 51 A None No Power Seat 51 A is an Economy Class seat located in the last row of the plane that has limited to no recline and the close proximity to the lavatories and galley may be bothersome. 51 B None No Power Seat 51 B is an Economy Class seat located in the last row of the plane that has limited to no recline and the close proximity to the lavatories and galley may be bothersome. 51 D None No Power Seat 51 D is a standard Economy Class seat, however, the close proximity to the lavatories may be bothersome. 51 G None No Power Seat 51 G is a standard Economy Class seat, however, the close proximity to the lavatories may be bothersome. 51 J None No Power Seat 51 J is an Economy Class seat located in the last row of the plane that has limited to no recline and the close proximity to the lavatories and galley may be bothersome. 51 K None No Power Seat 51 K is an Economy Class seat located in the last row of the plane that has limited to no recline and the close proximity to the lavatories and galley may be bothersome. 52 D None No Power Seat 52 D is an Economy Class seat located in the last row of the plane and the close proximity to the lavatories and galley may be bothersome. 52 E None No Power Seat 52 E is an Economy Class seat located in the last row of the plane and the close proximity to the lavatories and galley may be bothersome. 52 F None No Power Seat 52 F is an Economy Class seat located in the last row of the plane and the close proximity to the lavatories and galley may be bothersome. 52 G None No Power Seat 52 G is an Economy Class seat located in the last row of the plane and the close proximity to the lavatories and galley may be bothersome. 6 D None No Power Seat 6 D is a standard Business Class Bulkhead seat, however the close proximity to the lavatories and galley may be bothersome. 6 G None No Power Seat 6 G is a standard Business Class Bulkhead seat, however the close proximity to the lavatories and galley may be bothersome. 7 A None No Power Seat 7 A is a standard Business Class seat, however, the close proximity to the lavatories and galley may be bothersome. 7 J None No Power Seat 7 J is a standard Business Class seat, however, the close proximity to the lavatories and galley may be bothersome. 7 K None No Power Seat 7 K is a standard Business Class seat, however, the close proximity to the lavatories and galley may be bothersome. Audio Visual on Demand (AVOD) is available on this aircraft with an extensive selection of audio programming in multiple languages. This system is accessed via personal touch screen televisions. Swiss provides headsets free of charge onboard. Audio Visual on Demand (AVOD) is available on this aircraft with an extensive selection of movies, short programs and television series in multiple languages. This system is accessed via tethered handsets stored in the armrest. Swiss provides headsets free of charge onboard. A 110v AC power port, which does not require a special adapter, is available at each First and Business Class seats. There is no power in Economy. Each seat in First, Business and Economy has a USB port. This configuration shows the newest configuration of the 777-300ER with First Class and a staggered Business Class product. A new Economy Class is also featured on this version. Seat 33G is a bad seat. The metal rod of the row that is attached to the floor of the plane is placed so badly at Seat 33F that the person at 33F might have his or her right leg within your space. Feeling the leg of a stranger pressing against yours is awful when you want to sleep at this 12hr flight. Torture. It was literally horrible. It started out OK, the ticketing agent was amazing, said there was a decent chance of nobody in the middle seat. Yea right. They squeezed everyone on the plane and the person sitting next to me was very kind but a Swiss air non-revenue flyer. Very nice person, but had huge biceps. Literally thought I would prefer to fly in the lavatory seat rather than this. I have another Swiss flight coming up that I am strongly considering cancelling. I think I just would rather not fly rather than get squeezed into the 777 cabin in economy. Boeing 777 economy: Worst cabin ever! Whichever seat you are on, in this case 23A without window but with extra leg room, you will always be squished between passengers. Seat is narrower than those of any metro around the world. I have flown this airplane on 3 occasions as no other option was available, I constantly touched my neighbors with my shoulders on all 3 flights, and I am a skinny 188cm man. Only book flights on this airplane if longhaul relative comfort is not an issue for you. Armrests at seats number 49H, 49K, 49J are locked and can not be folded back! That was a nightmare to get off the seat and try to squeeze between seat in front of us and armrest! No one of flight attendants could help and unlock the armrest! That was really bad service and most frustrating flight in my experience! In the small forward Business cabin behind First. Quiet and comfortable, with easy access to the washrooms. Far superior to the huge and crowded main cabin. Wonderful crew. Excellent food and drinks. Traveld to SFO from Zurich and return.On the first leg Reserved seat 22A At an extra cost of100.of course you pay for the leg room. But this aircrft is so narrow and the seats were as if they are children's seat so narrow for even for a small person like me it was hell. the corridors are so narrow you have to almost walkside facing if you do not want to hit the passengers seated.I spent Christmas inSFO with a back problem. On ReturnToo late to reserve the bulk head so took the 23 D at 50 extra;.The two guys in front were so inconsiderate, , regardless of the extra leg room they had in front they reclined their seats to a maximum .It was suffocating. In fact I pâid a premium price of 1109 for this whole travel to SFO and back at so much inconvenience. The worst experience in my 32 years of traval. I will never never travel with SWISS Air. This is actually quite a bad seat! There is no extra legrrom because the door has a protruding bulge (emergency slide?) which is right in front of your legs. 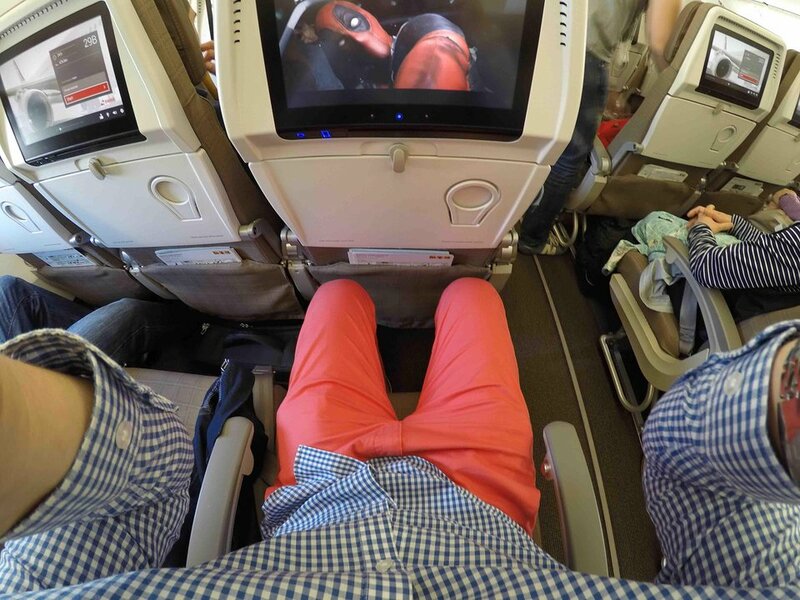 The only way to stretch one's legs is to go towards the legspace of the middle seat. Applies to 39A/39K, but not to 23A/23K, because on row 23 the door doesn't have the protruding bulge. Seats are very narrow, I fly internationally a lot and this is by far the worst plane, very narrow and cramped. The hallways are also narrower than usual and the crew didn't really bother to pay attention not to bump into you. NEVER again will I fly Swissair on this plane. The interior also looks very cheap, if I didn't know I was flying SwissAir I would have thought I was in an AirIndia or a lower quality airline. Absolutely horrible. Never again long haul on this cramped 77W. A very sub par product. This was a horrible experience. The plane was so narrow, it was impossible to get up and walk. I ended up with a vein thrombosis, something I've never had in my life and I fly long distances frequently. The seats were cramped as well and I'm a person of normal weight. 50D was probably the best seat choice since the aisle is a little wider there. Add to this, very poor quality food. I won't be flying Swiss again. Never ever flight with a B777 in this configuration (3/4/3). Absolutely narrow and horrible. From BKK to Zürich, 12 hours, a trip to hell. Look for A380 or B777 with 3/3/3 seat configuration for example THAI. SWISS in not a premium Airline, Sorry. They treat Eco passengers like cows. And they don't offer a Premium Economy like other Airlines. The only possibility is to buy a ticket for the very averaged and overpriced business class, it's around 8-10 times more expensive than an Eco ticket. SWISS never again! Unless you can afford business class or up, get ready for a horrible experience. This was an 10.5 hour flight from Zurich to LAX. The isle seat (which I paid extra for in the preferred section) is very narrow, my neighbor had his elbow in my side the entire time. And when the person in front of you pushes back his seat, there is hardly any room to breath, let alone to read or use your computer. I don't think I will fly with SWISS anymore on this Boeing 777 - it was a terrible experience. Other passengers were also complaining. Try to book row 51, seat A, B, J, or K!! the seats recline fully and the lavatory entrance is in the galley. This is the best experience I've had on a transatlantic flight -- the rest of the economy cabin is extremely tight so do yourself a favor and book one of these seats! Terrible, absolutely terrible. Although this seat has enough legroom (and I paid dearly for it!) the legroom was taken up during the entire flight by the waiting line for the toilets (just 6 toilets for almost 300 coach passengers!). And the seat (like the others) is so narrow that you are in a fight for shoulder space with your neighbor on the right while constantly being hit on the left by passengers or crew trying to find a way along the ultra-narrow aisle. I think that direct long-haul flights on Swiss are overrated and in the future will prefer a stopover just to avoid these absolutely awful Swiss 777s! My husband (1.85m tall) an I flew from ZHR to Chicago on 50D and 50E. I was worried about all the bad comments about the seats. I was surprised that the legroom was spacious enough. It is true that the seats are narrow but it was ok. The staff was very friendly and helpful. They served drinks regularly and we even had Mövenpick icecream, which I never had before on a flight. All together I must say that the flight was much better than expected! Economy seats are so narrow that an average European person will be extremely uncomfortable on long flights. The aisle seat have slight narrower legroom due to the placement of the seat anchor struts. I could not find a comfortable sleep position and my behind was sore after the flight. The aisle is so narrow that one is constantly brushed by other passenger going to the toilet or the FA during meal service and this makes it even more difficult to sleep. Going to avoid this in the future. I agree with other reviewers of this particular row that this was one of the better seats in the economy cabin. Not only do you only have one only one person to climb over to go to the lavatory, you also get a substantial empty space between your seat and the wall. This space was large enough to store a carry-on bag, as well as my shoes freeing up the space under the seat in front of me for stretching out my legs. It also negates the lack of shoulder room caused by the narrow 3-4-3 configuration. Finally, even though there is a bulkhead behind you, it does not seem to impede recline as the recline was actually very good and I did not have to worry about taking someone else's space doing so. As others said, the door to the lavatory is on the opposite side of the bulkhead so there wasn't much bothersome traffic either. All-in-all, I was very happy with my cozy little corner of the cabin, although I'm sure sitting in any of the middle seats anywhere else would be miserable. I'd definitely choose this seat again if faced with a similar configuration. As for the seats in general, although I abhor the 3-4-3 layout, I have to give Swiss credit for being generous with the legroom and seat padding. Not a good seat as the passenger sitting on the window seat (11K) has to climb over you to reach the corridor. Also, no window. BAD. REALLY BAD! This is the WORSE configuration (3-4-3) on a 777: seats are small, legroom is minimal, comfort is the worse ever experienced. It is sad cause I flew with Swiss A340 and was very nice in the past. But if you have to do a long-haul flight, avoid Swiss as much as you can. The plane is nice cause it is new, but this does not really count when you feel squeezed in a packed plane with less than average services. Never again. Hated my seat. If you look closely, you will see that the center seats and single side seats all have 1 or 2 tables per seat. Side double seats have one table to share. Very, very cramped. They should charge less for the side doubles... they are super crowded, one has to crawl over the other, no privacy screen between, and no room on shared table. Terrible. I had this seat for the 12 hour flight from Hong Kong to Zurich. The seat is narrow and located where the seat configuration changes from 2-4-2 to 3-4-3 and the aisle narrows. I was hit on the shoulder by flight attendants as they walked past and was hit by what seemed to be every other catering trolley coming from the rear galley. Most uncomfortable! I suspect that 49G would have similar problems. Terrible seat. Never will ride Swiss again in economy, and likeley never again in any class. Could not open computer to use when 23A had seat back. Knees rubbed against seat back. Leg room too small. When 23A seat was back distance of my face to back of the seat screen was 11 inches. Made the mistake of reserving an aisle seat at a cost of $40: a waste of money, since all seats are equally bad. Seats are too narrow, as are the aisles. While there is pretty good leg room, knees rub against the seatback in front, and shoulders rub against the passenger to the right or left. Service was mediocre, and food was downright awful, much worse than on Lufthansa. 10-across seating on the 777 transform the aircraft into a bottom-basement ultra high-density holiday flight, not in keeping with the "mainstream" reputation of the former Swissair. One redeeming feature is that the Zurich Airport is smaller and more user-friendly than Munich and especially Frankfurt, and easier to make connections. The entertainment screens are large and well-designed, and the 3D navigation tracking system helps keep your mind off of the negatives of the seats. Seats 50AB,JK & 51AB,JK are possibly the better economy seats on this plane for the 12h40m flight SIN to ZRH.Although the seats appear old and not comfortable.The flight was full and cramped with the 3-4-3 configuration in economy class.Use another airline such as Lufthansa for better seats. 4D was exceptionally comfortable and quiet. It is located at the bulkhead between business class and first class. This is only a wall, there are no lavatories, crew storage, or kitchen areas. There are compartments to store items so you don't have to put everything overhead during taxi, takeoff, and landing. There was almost no foot traffic throughout the flight. My wife and I traveled together. She was in 4G. Sitting in the middle seats worked very nicely for a couple. One of my favorite business class seats. The food was adequate, but leaves a lot to be desired when compared to other European carriers. No power at seat. Will avoid economy travel on this airline on the future. My wife and I sat in 8 A/B from ZUR-LAX in May and absolutely loved it. The lie flat option is wonderful on a 10+ plus hour flight and it has a recline feature that's just as good. You have to use the headphones provided by the airline as the entertainment system only accepts 2 prong jacks. Even the Bose adapter didn't fit, go figure?!? Lots of movie and TV show options, and the music was decent. I loved the air map feature and it's different choices. The window seat occupant is basically trapped if the aisle seat person is reclined or lies flat. The crew were excellent, very attentive, friendly, and helpful in every way. On this aircraft there are two lavatories on one side, choose that side it makes a difference. Pillow and blanket were very good. All in all time flew by. Not the best business class but it's very good and the crew make it great. This is a bad seat for real. Less leg room, because the these seats are not aligned with the ones in front of them (50J has less leg room than 50K). When the person in front reclines, you'll have the monitor in your face. More room for hand luggage though. These seats (51 A-B) do recline, and there is noone behind that you have to consider. Some extra space on the side as well, as there are only 2 seats here. Better than row 50, which is misaligned and has less leg room. Good seats! Seat on row 36 cannot recline. This is true for all the seats with a wall behind them. Less width and more expensive ! Swiss packs 10 seats in the width while other companies only have 9 for the same economy class (but cheaper) Not only are you cramped in your seat but the passage is so narrow that you always bump into somebody's leg, shoulder or elbow when you walk. Only positive is leg room below the seat, although distance to screen becomes minimal if the passenger in front reclines fully. SIN - ZUR 14K didn't find the misalignment of the window too much of an issue being a night flight but even a day time flight you just need to lean forward slightly.Food and cabin crew were spot on,1 young man came and spoke to my wife and I for quite some time,purser came through the cabin with 2 boxes of chocolates handing them out and my wife jokingly said if you have 1 spare she'd have 1,a few minutes later he brought her a large box of chocolates,big thankQ. First impression the is good but doesn't seem as wide as you think once seated, the decor is very 'business' like as in an office appearance, plenty of adjustment with a massage mode,tv is angled downwards possibly for watching when laid down.TV had no sound at first and then a male staff member sorted it, apparently there's a switch underneath that the cleaners catch when doing there job.Rest of the staff were spot on and the grub was good, especially the beef main course. There was definitely more leg room for this bulkhead seat but the width was confining and uncomfortable when seated between two broad men. Felt like I gave up a full 1/4 of my seat. On december 20 2017 we flew from Miami to Zurich. Economy section totally full. I was seated in the middle seat as I exchanged my corridor seat with another passenger to stay seated near my husband. This was the most awful trip I had ever taken in my life, thanks to Swiss squeezing 10 seats when there used to be 8. I had cramps in my legs, the passenger in front of me reclined his seat from the beginning to the end. Trying to get out of my seat was a very difficult task, as well as eating as there was no space at all. Moreover, the entertainmbet screen did not work. Flight attentands waited three hours before comimg to see what was wrong and they were not able to fix it. It is disgrasful for Swiss to have done this. Never again I will fly with you SwissAir! For people reading: spend a couple hundreds more dollars and fly Lufthans Premium Economy, a wonderful experience. And Lufthansa flight attendants so much nicer and responding to passengers's calls. I agree with the other reviews Swisss biz class cabin looks amazing but when you actually settle into the seat, it oddly claustrophobic, even in the stand-alone throne seats. I couldnt find a comfortable sleeping position (Im 59 / 178 cm and slim), and my feet kept hitting the very narrow cubby. The seat seems to be made from air cushions, which in my case were either very hard or a too soft, like a gel seat. The flight attendants were friendly, the food below average, the wines excellent on my flight from LAX-Zurich. Seats 7D and even more 7G are bad seats compared to what the 777 cabin has to offer. The room for feed is dramatically smaller and 7G has moreover les rest for the arms. B777,this 3/4/3 configuration is extremely unpleasant. Very narrow. A cheap charter feeling. Not adapted for a premium Airline. I will avoid in the future this plane. Yes, the seats in 50 are misaligned compared to 49. The real pain for 50B is that while it has two monitor screens even (behind 49B and 49C) both screens are so shifted to the side that either your neighbour on 50A gets to watch what you're watching or the rearward audience can share your viewing preference. I disagree however with the bad comments around legroom. I flew in and out on 50B and 50A (10h plus in either) and found more space to tuck my feet under. You just have the seat struts in front in the middle. 50A is certainly the better of the two. This comment is also valid for 50J. 4A, 7A, 9A and so on. Be aware that Swiss charges extra for the single window seats. Just tried to reserve a seat from Chicago to Zurich and Swiss wanted $149 extra for any of the single window seats. They should be marked 'premium' and that in Business class!! Seat reclines than any other seat, which is great. It also has a little space next to the seat to store covers and stuff like that. But for that reason, there is a gap between Window and seat. 29G was comfortable because it was an aisle seat. I sat on this flight from Zurich to Chicago & was fairly comfortable. However, I am only 5'2". Anyone tall or heavy would be less comfortable. Warning if your tray table is open and you have a full glass on it. If the person in front of you reclines their seat, chances are they will knock over your drink. I was on night flight to BKK. There is nothing to complain. Even if you make fool use of your hand luggage you can't fill all the compartment around the seat. Only problem came with my stupidity. I dropped my MP3-player so it fall in the mechanics of the seat. In BKK they called a mechanic to get it out. The seat is actually so confortable that I think the flight to BKK is to short so you could sleep longer. 51AB/JK are great seats. Plenty of room (even behind window seat), good recline with nobody complaining, 2 full windows to look outside. I would never choose any other seat in LX 777 Economy! No idea why still marked as bad seats. They should actually be green. No problem with people going to the washroom at all. It's not that bad. Even reclined somewhat, I didn't intrude on the passenger behind me. It does require you to get out of your seat, so the middle and window seat passengers can get out. Again - not too bad, since you want to get up and stretch your legs. Seat pitch is good and the seat width is acceptable. I had a taller guy sit in the middle seat with no problem. The lavatory line does extend up to my row. I would choose Swiss again over the current British and Lufthansa business. The seat was very comfortable for sitting and has a large footwell for sleeping. There is not good sleep leg support (I put the blanket under my knees) and sleep elbow space is limited. The temperature is warm (I was OK in shorts) -- Zurich airport was uncomfortably hot. Entertainment has a responsive touch screen but limited programming. There was no flight camera. The window seats are OK for couples: there is a divider that requires leaning forward for talking -- I had a better view of the person across the aisle. The two seats in the very back are regular, decent economy class seats. They don't recline further than other seats but also not less. The restroom behind is not really a problem because they are accessible from the emergency exit galley only so people don't actually stand in front of the two seats. There is a little more leg room due to the concaved shape of the plane. You also have a little more room on each side of the seats for the same reason. I'd fly there again if I can't get business class. 7A is fantastic! Given the notorious reputation for a lousy economy class, I bit the bullet and paid for an upgrade to business class. As other reviewers have noted, the business class on this aircraft is a mixed bag. Some I definitely would not have wanted (2 per window!). But...7A was a dream. I had the same space in one seat as the people behind me had crammed into two seats. Huge! This is the bulkhead seat with tons of leg room and a cabinet on each side. The bathroom use was not an issue at all because you have a cabinet seperating you from the aisle. I would steer clear of the aisle seats that only have a small arm rest, or that share a table. 7A however was pure luxury and privacy. If you can get this seat, grab it! A and K jammed against sidewall of airplane so little shoulder room. Position of light controls on inside of armrest leads to larger people accidentally turning on/off reading light. Seat very hard. Curtains in front of seats C and K block light from lavatory but are frequently brushed over passenger's legs as crew/passengers pass through. As with all airlines who have squeezed 10 seats/row, just avoid if possible. I flew with my wife next to me, assuming we could see each other, talk to each other. No way. The new seat configuration in BUS has a large partition between the seats, so can't even ser each other! Might as well book two separate single seats which have much more stirage space. The configuration of this aircraft is the worst I have seen, Seats are too small and no legroom whatso ever. The corridors are so narrow that the cart has difficulty to pass without seating passengers leaning away . I will take any day Airbus . I will never fly again swiss on a long haul Beoing 777 ER . Applies to 51 AB and 51 JK The seat recline is MORE than a normal seat and quite comfortable. The bathrooms in the back of the plane and not used much and somewhat hidden. Had very little bathroom traffic to endure. 50B and 50J have less knee room because the angle of the 2 seats is askew from the row ahead. The room for feet is actually better because there is a 2 seat space for your feet. On of the best seats on the airplane. On my way out I flew in 15k which already was a great seat. But you have even more legroom. The toilet is not disturbing at all since you have not just an armrest to the aile. Best business experience so far. New seats are a great improvement over the ones in the A330/340. Finally I had enough space for my feet. Flight YUL => ZRH, about 7,5 hours. I don't understand why people write that 12K is a bad seat. It's very good, otherwise than written it has a window and most of all it's a business class seat where you are on your own. So you have plenty of space to place your items, laying down flat is comfortable, you can sleep well, also laying in different positions for watching films on the big screen is comfortable. Staff was very friendly. Only complaint: If you rest your arms on the side be careful to not move the seats with the buttons. In bref: I liked this business class seat and the service of Swiss very much. I'm 5"11 tall and had no problems. The entire business section seems claustrophobic and out dated. Big boxy seats and dividers hem you in from all sides. To get into flat seat mode, you sink down so low that it feels as though you are in a motorcycle sidecar with a blanket over your head. I am 5'10", 170 and flat arrangement was very uncomfortable. Food was not worth eating. Service was excellent and courteous. Find some other business class on a different jet. Pros: lots of stowage available and nice big screen, also no need to climb over someone else to get out of the seat. Cons: in bed configuration, the seat felt very narrow. Very uncomfortable for a 12 hr flight. 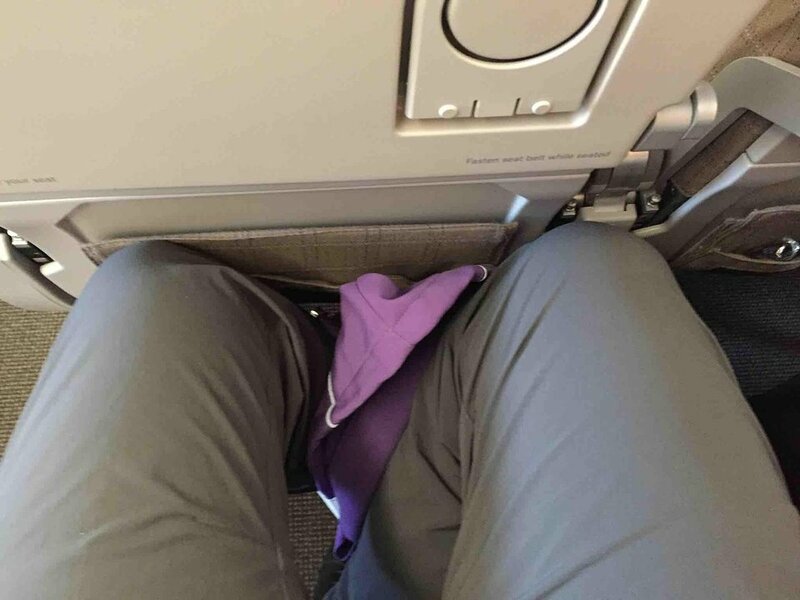 I am 5'10 and had my knees against the seat in front. Difficult to get comfy to sleep. Entertainment ok, good touchscreen system, only spoiled by random reminders that we were going into night configuration and shouldn't use phones?? annoying in the middle of the night when every screen lights up. Evening meal good, breakfast poor. Would be nice if Swiss treated their economy customers with some respect, maybe their executives should try a 12 hour economy seat once in a while. I habe little choice in the flights that are booked for me, if you have a choice there are better options. I am flying with my dog, and they gave me seat 36K, it is an assigned "dog in cabin" seat. This means I will have to stow my dog in his carrier under the seat in front of me. So if you have seat 35K, there may be a small dog under your seat. Could be a concern for people with severe allergies. Boy did I learn a lot about travelling with a dog thes last few days! My wife and I were in 8 A/B and we cannot understand why Swiss decided to use these seats on their new 777ER. The seats are an example of poor industrial design. Between the seats there is a box containing the tray tables ( and making the space feel very claustraphobic), the seat controls are placed perfectly for one's elbow to continually move the seat position, worst of all good in flat bed configuration but impossible to get comfortable positions otherwise. Not as good as the old seats on the A340 and a generation behind everyone else's seats. Getting out of 8A was terrible as the space was not enough. For the return flight we have obtained seats in the middle, which although they have all the same faults both of us can reach the aisle without a requirement to be an acrobat. The worst Business Class seat I have sat in for such a long haul journey. Not only is there no window, as there is a person next to you you have to climb over them to get out. Plus your neighbour shares the same table for drinks etc. Definitely not worth the money. The A330s and A340s are far superior. Horrible layout.. hardly any stowage space. Headphone socket upside down. Hosties were indifferent and service generally chaotic and unprofessional. I have written Swiss that I am going to boycott the flights with the Boeing 777 because the configuration 3/4/3 is a shame for a premium Airline. I am 1.70 / 72 kg and I didn't have enough space. If you can get it, seat 4A is definately the best Business Class seat on the plane. Not only does the feet cubby not end up in tight spot, it is fully open and the width of the seat. I could not actually touch the end, most of my 6'4" body could have fit into the hole for the legs. There is an insane amount of space. Business class seat was the most uncomfortable I ever encountered. Could not recline comfortably for the 11 + hour ZURICH-LAX .Flight attendant actually told me I had already had my bowl of nuts and could not have any more when I asked for them. I was looking forward so much to my first flight on the new SWISS flagship. But the disappointment was very big. It is a huge shame for a premium carrier like SWISS to fly a 777-300ER in a 3-4-3 configuration. Due to an emergency stop-over (medical reasons) in Baku the flight was finally delayed by almost 6 hours. To sit in this cramped and hard seat for about 16 hours was a sheer horror. I would highly recommend SWISS to change their 777s to a 3-3-3 configuration. Otherwise they will lose customers to other more competitive airlines, such as Lufthansa, Thai, Singapore or Cathay. For me it was definitely the last flight on a SWISS 777-300ER. Wow, what a disappointment. Just be aware that if you've chosen an aisle seat you will be bumped all throughout the flight. The aisle is just to narrow for the crew and the passangers. Just landed after a 12h flight from BKK to ZRH. I'm 185 90kg, and this layout of 3-4-3 is, to my opinion, not suitable. Additionally, the service was rushed and heavy handed. I gave SIWSS a chance on this flight as I normally fly with Lufthansa. Well, I'll be going back to Lufthansa. Their A380 Economy setup is much more comfortable. It's a shame, I'm Swiss and would prefer flying with SWISS. This was a flight from ZRH to VIE. I was glad to get off the plane after 70 minutes. Armrests are small and too low. Seat too narrow in width. This ECO-Seating is definitively sub-standard and should be avoided by all means. Welcome to Swiss-Air Boing 777-300 means welcome to hell for people above 1,80m. I am taller, yes and I didn´t knew, Swiss Air is selling Emergency Exit-Reservations!!! for 79,- per int. flight. For my flight back 13 hours, I payed. Now I have to to with pain in my knees and muscles of legs and bag. I call that unpunished criminal assault. And for 158,-  more I would have found an alternative. This seat should be marked in red, like 23 A-K. (1) The inflatable slide attached to the emergency exit takes away all the potentially additional legroom. On top, people will come and stand in that area, often stepping on your feet (I was awaken twice because of that). (2) There are no power plugs, only USB port attached to the screen, which is difficult to use if you keep the video stored. (3) The seat is truly uncomfortable. Although it reclines quite well, the seat is hard like a stone. The curve shape of the cabin takes away some room. I am not giant (185cm x 72kg), but I had to (try) sleep twisted so to avoid the shoulders of me neighbor and the wall of the cabin. Overall, terrible experience. 3-4-3 configuration is excessive on this aircraft. The crew was very young and inexpert (aside from wearing their uniforms rather free-style, they lacked coordination and timing, even the bread was cold like a rock). I would find no difference between low cost carriers such as Norwegian and LX. It is even more disturbing as LX Business and First class are really top, while Y class is just at the level of low cost carriers. I'd rather stick with LH or SQ. I had plenty of time to get my seat in advance and wasnt aware of this site. On flight out (flight 41 lax-zrh) was in seat 32A was fine. Im a pretty big guy (6'1") and found the legroom and seat comfort adequate. Little noisy but to be expected behind the engines. My flight back I wanted to stretch and have a window seat so chose 23A.. GROSSLY HUGE MISTAKE!! The seat tray as mentioned makes the seat narrower. Whats not told is the emergency door frame impinges your leg room even more by about 4". Also mentioned here no window there. Also not menrioned is the constant sub arctic cold air blowing from the doorframe freezing both your legs and feet. I fly many many miles a year and this made even me feel chlostrphobic. Bottom line, avoid these seats at all costs. These seats (23A and 23K) should be avoided at all costs and shouldnt be seats there in the first place. Choose a different plane/airline if you can! This plane does not have economy plus seats, so all economy seats are the same in terms of size and legroom (except exit row). This aisle seat is in the front part of the economy section, but as uncomfortable and cramp as the seats farther back. I will try hard to avoid flying with Swiss on this plane in the future. This was the worst seat on any long flight I've taken (I fly cross atlantic 5-6 times every year). The cushion was hard, legroom was terrible (I'm 5'3" woman), and aisle was so narrow no one, including flight attendants, could walk down the aisle without touching you. TERRIBLE! The seating in middle row is extremely uncomfortable. The metal brackets that hold the seats to the floor are placed out of line with the seats, and result in compromised leg space - leg space that is extremely tight to begin with - with the added problem of having only 3 spaces to stow away small luggage for 4 passengers. This occurs on every single row of middle seats (D, E, F, G). It is incomprehensible how SWISS can have such compromised seating arrangement. Clearly the airplane was not designed to seat 10 abreast. I choose row 50 and reserved a seat well in advance. This worked perfect. I would never ever book a 3-seat combination for us as a couple, especially not for a 3-4-3 combination as Swiss now offers. 50A is OK, 50B is slightly smaller space because row 50 is adjusted to the smaller wide of plane, however 50B has a second turndown table due to th 3-row in front. People do not bump into 50B, due to protection from row 49. Seats itself are really cramped (wide), footroom is similar to old 2-4-2 seating. However the whole flight is cramped feeling. If I cannot get row 50 either side I will use any other airline in future. I got shocked when I saw their new economy cabin and decided to use miles to upgrade to business class rather than to spend 13 hours in the new economy class. It took me 65 000 LH miles and a week later they confirmed I was upgraded. It was a HKG-ZRH flight, seat 15K that is a "throne" seat. What a fab experience it was! The best seats I've ever seen. Twin C seats are also good but in a throne seat you can feel like in first class. The bed was very comfy; adjustable seat/bed softness and massage options were great! 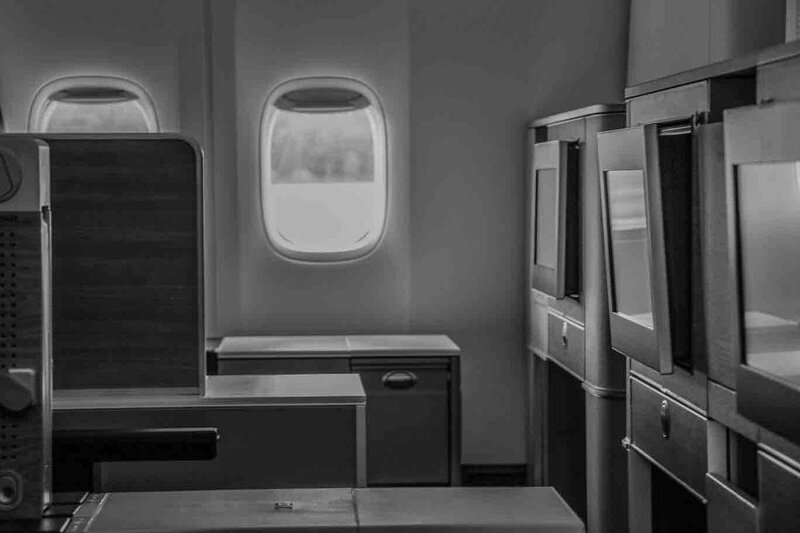 Most other airlines' biz products feel like economy compared to the Swiss new planes. That of course applies if you can get a "throne" seat. Oh yes, the food was also really good but service was pretty mediocre. This configuration with 10 seats in Y-Class is extremely tight. Luckily my flight was only a short flight, but I felt already very uncomfortable. Even being a normal sized person it is absolutely impossible to seat normally or in any way comfortable. Sidewards you permanently touch shoulder of your neighbor and no idea how they measure legroom with 32 inch ... it feels much less. I cannot imagine sitting for a long-range flight in such a position. Even being a good friend of SWISS, I will (have to) avoid flying this aircraft. Very sad as this is in no way Swiss Quality or premium airlines style. Even though a 343 configuration in Y surprisingly comfortable. Nice size of Screen. No boxes anymore below the seats like the A343 have. Both flights were not full - nice to have an empty seat in the middle! Flew HKG-ZRH, 13 hours, fully booked economy. Was the worst flight of my life. The seats are ridiculously small in this 3-4-3 configuration with barely any room in the aisle. I'm not a big guy but even I had to walk down sideways to not slam into people. All 3 of us on my row boarded about midway through the boarding, and by that time our storage locker had been filled already with bags, and every locker in the back cabin was filled, so we had to JAM our bags under the seats in front, making it impossible to even stretch our legs out for the whole trip. Sad to see Swiss go from such a comfortable A340 configuration to this sardine-like monster that Boeing have furnished. Will be flying this route via the middle east on the more comfy carriers from now, sorry Swiss. 1/10. The last BC row (17) is too close to the first EY row: 22/23; only a thin wall and curtains serve as a divider of the EY compartment. The first row in EY (22/23) is the preferred place where mothers with infants and small kids are placed. On our flight we were exposed to screaming babies for most of the 12 hour flight. The new BC seats are more cramped on the 777 compared to the A340 from SWISS. The double seats offer even less space than the single seats. Avoid the Swiss 777. The cabin crew did a good job from ZRH-LAX. On the return flight (in row 12) the cabin crew was busy with accompanying family members and friends; the rest of the passengers were hardly noticed - poor service. It's shame for Swiss have this kind of 777 configuration. Economy seats are very narrow, seems that passenger are seated one over the other!! The is not enough space for the hand luggage store, people "fight" to place their things and the flight attendants are not helping. This cause waste of time boarding the passengers!! Try to avoid to flight on this 777!! Seat and seating in economy definitely not suited for long distance flights. Besides the cramped position due to proximity to the wall and the protruding door, there is very cold air coming from the door flowing over your legs. Even with blanket you will feel cold. And I even payed more for the extra legroom. This is not what people expect from a brand like Swiss! Another excellent flight with Swiss. Much better than their A340 first. I forgot to mention, it's closed suite now, but process sounds weird. Definitely worth 70000 LifeMiles. You actually need put privacy screen (aisle side) and door together to make your suite fully private. agressive , unpleasant and disagreeable flight attendants, the food was not good .. flight from hk to zurich ( both fiscal paradises , you guess the kind of customers who traveled ! I couldnt see a smile in the plane ..
All economy seats feel extremley cramped! The armrest was broken, thus, irremovavle. I found it not a very great aircraft as it is Swiss's flagship plane. They could defintley do alot better in terms of passanger comfort. Horrible, narrow, no space for legs and arms! how can they build a new airplane like that? This is the best seat I ever had on an airplane (and I've been on lots of them). There is plenty of leg room and the seat reclines a lot more than any other seat. I will always try to chose this seat every time I fly from USA to Europe! It makes a 12 hr flight that much more comfortable! Outboard seats in Business are woefully cramped. There is minimal storage space. The window seat passenger cannot get past the aisle passenger without difficulty and only with great difficulty if they have reclined their seat to any extent. The lap sash seatbelt is uncomfortable. My seat controls only worked intermittently and my wife's controls ceased working completely half way through the flight. Care factor of the cabin crew was minimal to put it politely. We will never choose these seats again. The central doubles appeared to have much more space and allow ready access to the aisle.The wooden coat hangar provided is a nuisance and mine fell down into the seat control innards during the night after I inadvertently dislodged it. It took several minutes to locate it and extract it. On a positive note, the meals were delicious. Terrible seats in economy! Extremely narrow, very uncomfortable. From my perspective it is the worst long-haul seat I have ever seen. And the authorities should look into the security of such a terrible layout because I think there is no chance to evacuate the economy class in an emergency when it is fully booked. Just terrible!! Seats: 39A/B/C and 39 H/J/K don't have a window. Like 23 A/K. First flight on Swiss' new 777 - and a short one, thank goodness. Unbelievable narrow seating (Economy). After about 30 minutes my left leg began to cramp. I imagined the horror had this been a long flight. When the row in front of you goes backward you can't read or watch the movie. I probably would have had to stand most of the time. The only comparable flight was on a Tupolew 134 several years ago, but there I could move sideways. Sorry, Swiss, never ever again. A short GVA TO ZRH On the new T7 on August 13 didnt give enough time for a full evaluation but suffice to say removing and storing the tray table was dangerous. Once the release button was located it opened easily but storing it for landing was really difficult. I noticed several others experiencing the same problem! First flight on Swiss 777-experienced business class traveler.Air con / pressurisation noise unbelievably loud. Could not conduct a conversation with passenger next to me. Cabin crew agreed - they did not know why. The noisiest aircraft I have encountered in 40+ years of flying. Swiss have a serious problem with this plane. Economy in this plane is truly awful. I am a frequent flyer with Swiss - ZRH to BKK about 8 times a year. The old A340s were really nice, but the seats in the 777 are so narrow and the aisles are so narrow it is ridiculous. Just suffered the most uncomfortable long-haul flight in a long time. On the first flight i was upgraded to Business as a Senator. It was very good with 180 degrees flat seat, BUT, the Economy on the way back is terrible, horrible, 100% never fly again with a 10-abrest 777-300!!! It is a torture for a human!! I flew Swiss many times before with the A340 to HKG which has one of the best Economy seat. They should use that one as a "Premium Airline"!!! Entertainment system in Economy class is super nice. You can start it right away and it stays always on even during take-off and landing. It is super fast responding to every touch and the choice of movies great. Congratulations SWISS. I have to say that I was a bit disappointed by the food, which has been better. Will not be flying Swiss anymore. Seats are new and the recline and footroom much improved BUT seats are too narrow and aisle is too narrow. And Im a medium sized female. I saw a few people actually stand on seats to get in and out ofnaislenacces aisle in order to use the restroom. It is a waste of money to pay for a seat upgrade in economy. There is no such thing existing. Also, ovehead bins are now too high for me to close without standing on the seat. beautiful new plane but awful seating configuration in coach. seat itself would be comfy, reclinings is cool with the seat cushion moving a bit forward. but ways too narrow seats. configuration 3-4-3. others have 3-3-3 on longhaul flights. eating normally is a nogo when you have a 190cms guy seating next to you. Was flying HKG-ZRH recently and was quite disappointed with the new business seat in the 777. While the seat has some nice details (lights, boxes, storage space) and a big HD touch screen for the IFE the seat itself can't made fully flat (see photo once I manage to upload one). For a brand new business seat this is quite a disappointment, especially so in a wanna-be "premium" airline. Service was ok, neither specially attentive nor bad. Having the food served on a small tray gives a bit an economy class feeling. And why do they only provide a table cloth for dinner, but not anymore for breakfast? Strange and not consistent. Horrible. The plane itself is new and beautiful, but the seating is unbelievably cramped. I haven't flown this uncomfortably in well over a decade. 10 seats per row, about 4 rows too many in the economy area overall. Eating "normally" was impossible, had to eat in shifts, holding the meal container up with my elbows in. Swiss! you used to be so nice! I can't fly like this anymore. I flew with SWISS from New York to Zurich on the 21st of April, 2016 in First Class (1D). The flight was amazing and the staff super friendly and helpful. The seat was very comfortable with a full 180 seat recline. The seat was soft and very nice. I will definitely fly with SWISS again! no space underneath the seat in front (23A) to put a bag. not sure if this is due to the design of the exit row seats or an issue for all window seats. overall, Y cabin appears cramped, probably due to the ten-abreast seating. I flew ZRH-HKG on the new 777-300ER in seat 14A. I had plenty of room and personal space to store my things. The seat was a fully flat bed. The service was OK however it did indeed take a while to be served meals and drinks after take off. The seat, once made into a bed was brilliant. I slept for 10hrs of a 12hr flight. I would highly recommend seat 14A if you are travelling solo as I was. This aircraft is a vast improvement on the A340-300 which I flew from SIN-ZRH the week before. The seat felt a bit narrow, however the seat cushion was very comfortable even after a few hours into this long haul flight. Entertainment system was also improved, displaying larger, high-definition screens. Very disappointing business class. Seats not horizontal, too narrow, and too many seats. Service takes an eternity, and crew is correspondingly stressed. Also, design is too dark/old fashioned and adds to the bad atmosphere. Plenty of leg room due to the emergency exit, however no window and quite narrow as the door and the cabin wall are protruding. Room for your shoulders is thus more limited compared to the stanadard window seats, felt a bit cramped. There are 10 seats per row and there are lots or rows. Yes, the seats do recline further than on the Airbus 330 and the entertainment screens are bigger and all touch screen. The entertainment boxes beneath the seats are mercifully gone. BUT, overall it feels incredibly cramped and the much touted space saving seats are thin, hard and unconfortable - a bit like on a commuter train. Not a pleasant flight experience! Hi, I am writing about the in-flight amenities. In general, there are no tethered handsets in economy class. Everything including reading light, etc., is controlled via touch screen. As per SWISS this should be fully flat and not angled lie flat. But I got the impression it is something in between angled and fully flat. Additionally I have to comment: - 7K is a place with very limited personal space opportunities. Only one box to put in personal belongings and only for very flat things (in front of the seat under the screen) - Plugs for electronic devices in danger as you might damage it when you have to leave your seat. Good: As it is a bulkhead seat, you get more free space for your feet to sleep. From this point of views the following seats shall be colored as green: 4A and 7A. The proximity to the lavatories and galley are not really bothersome as you have a good big private area in this seats. Seat 5K is indeed a single-seat. But with following mixed/bad reviews: - A box is blocking you from good access to the one window. One Window is missing - You place your feet into the box of the row in front. You don't have space to turn your feet comfortably and a more then 1.85cm tall person get critical space. - The connection to charge phone (electronical and USB) on the side where you leave into the aisle. This could be a danger to damage your charger cable or the connection. - Some of the extra space is not so easy to reach and the remote control panel for the screen is hard to reach and put back. Enhancements: - The screen is touch screen and brings more feature for the Airshow - The seat is in a very quiet area of the plane and even the engines seems to be more quiet. - It is not really bothersome to be so close to the galley. SWISS flies 1 versions of Boeing 777-300ER.